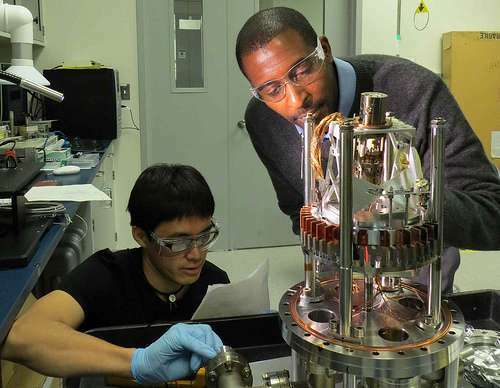 Postdoctoral researchers Marvin Cummings (at right) and Nozomi Shirato adjust the microscope before an experiment. (Phys.org) —Getting the atomic-level fingerprint of a material takes a lot more than just a dab of ink. By pairing the capabilities of X-ray analysis and extremely precise microscopy, scientists at the U.S. Department of Energy's Argonne National Laboratory have developed a way to simultaneously determine the physical structure and chemical makeup of materials at close to the atomic level. The research opens new routes to the next generation of materials for a wide assortment of energy-related applications. Since its Nobel Prize-winning invention in the 1980s, scanning tunneling microscopy (STM) has let researchers view an immense range of different materials at the atomic level. STM offers a finer degree of spatial resolution than virtually any other imaging technique, although it has one significant drawback, said Argonne nanoscientist Volker Rose. "STM was an incredible breakthrough when it was discovered, but the problem with it is that even though we can basically see where all the atoms are, it doesn't provide direct information about the chemistry or the magnetic properties," Rose said. Overcoming this "chemical blindness" while keeping the ability to study materials at such a small scale has proved challenging for the scientific community, but by combining the resources offered by Argonne's Advanced Photon Source, Center for Nanoscale Materials and Electron Microscopy Center, one of Rose's recent studies blazes a path forward. In the recently published study, Rose and his team report on a new technique, called "synchrotron X-ray scanning tunneling microscopy," which unites STM with the synchrotron X-rays provided by the Advanced Photon Source. The team used a tiny copper sample to determine the limitations and opportunities of the technique. Alone, the synchrotron cannot achieve the spatial resolution that STM offers, but jointly they provide the quality and type of data the researchers looked for. "One can think about our scientific abilities as similar to the abilities of an athlete who is good at multiple sports," Rose said. "A baseball player might not be terrific at soccer, or vice versa, because the requirements for each are different. But having a person—or in our case, an experimental technique—that combines the power of multiple approaches will have a lasting impact and hopefully accelerate the development of a number of new technologies. "Currently, each tool is used by a different scientific community, but this is a great example of when combined expertise can really speed discovery," he added. Because synchrotron X-ray scanning tunneling microscopy could be used to investigate a vast array of different materials, Rose believes that the technique will help scientists and engineers develop new generations of catalysts, nanoscale magnetic systems and solar cells. "With catalysis, having this degree of resolution will show us where the active sites are on individual catalysts, and we can see exactly how the reaction occurs," he said. "With solar cells, we can get a much better view of the surface impurities that currently reduce their efficiencies." Rose anticipates that the new technique will ultimately be able to study the electronic, chemical and magnetic properties of individual atoms. An article based on the study, "Synchrotron X-Ray Scanning Tunneling Microscopy: Fingerprinting Near to Far Field Transitions on Cu(111) Induced by Synchrotron Radiation," appears in the May 28 issue of Advanced Functional Materials.